In the Winter 2013 semester, the Reuther Library worked with students in the Graduate Certificate in Archival Administration program at the Wayne State School of Library and Information Science to produce a series of student-written, guest blog posts. Julia Teran is in the process of earning an MLIS, an MA in History, and an Archival Administration Certificate. A few of her research interests include digital preservation, historical interpretation, local history, and American women’s history. In 1974, the United Farm Workers Union (UFW), led by Cesar Chavez, opened Agbayani Village, a retirement complex for Filipino farm workers who had immigrated from the Philippines to California during the 1920s and 1930s. Due to racial discrimination in the form of anti-miscegenation laws, these migrant farm workers were prevented from marrying outside of their race. 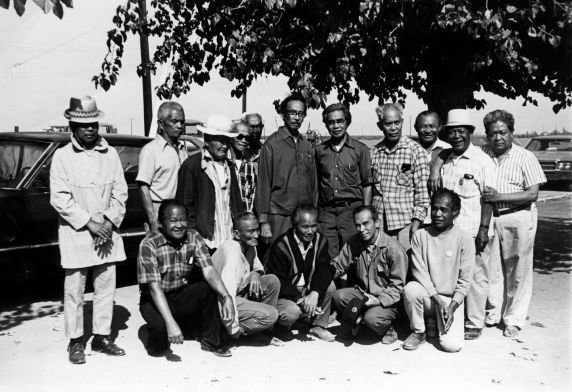 Since most of the farm workers were single men, and very few Filipino women had migrated to the United States at the time, the majority of the workers were unable to establish families, and many of them were destitute and had no one to help them by the time they became elderly in the 1960s and 1970s. In order to ensure that these men would have somewhere to turn for assistance in their old age, the UFW organized the construction of Agbayani Village. The village was named in honor of Paulo Agbayani, a Filipino farm worker and UFW member who died of a heart attack while picketing the Pirelli-Minetti Winery in Delano, California in 1967 during the Delano Grape Strike, which lasted from 1965 to 1970. The strike began on September 8, 1965 when 1,800 members of the Agricultural Workers Organizing Committee (AWOC), who were mostly Filipino farm workers, walked off the farms of 33 local table-grape growers because they wanted better working conditions and their current wages to be raised to equal the federal minimum wage. The AWOC was led by Philip Vera Cruz, Larry Itliong, Benjamin Gines, and Pete Velasco. One week after the strike began, the AWOC was joined by the predominantly Mexican-American National Farm Workers Association (NFWA), led by Cesar Chavez, Dolores Huerta, and Richard Chavez. In August of 1966 these two groups merged, forming the United Farm Workers Organizing Committee (UFW). Eventually, over 2,000 farm workers became involved in the strike, and the movement gained national attention. The strike came to an end in 1970 when the UFW finally succeeded in reaching a collective bargaining agreement with the table-grape growers which improved the wages and working conditions of over 10,000 farm workers. A complete history of the UFW, written by Philip Vera Cruz, is available as a handwritten document in the Philip Vera Cruz Papers. Initial correspondence and meetings about the building of Agbayani Village began in early 1970. Construction commenced in 1972 with volunteer help growing to more than 1,000 students, professionals, and grassroots supporters of the UFW over the next two years. Architect Luis Pina from San Jose, California, drew up and donated the building plans for the village. By 1974, six interconnected buildings in the shape of a U on approximately two acres of land in Delano, California, had been completed. Composed of Mexican-style wood frame buildings with adobe veneer and red tile roof, the total area of Agbayani Village was 23,000 square feet. Within the village were 60 apartment units, a large patio, lounge, dining room, arcade, a modern kitchen, and a courtyard with a fountain. The $250,000 project was financed by the Martin Luther King, Jr. Farm Workers Fund, and was administered by the National Farm Workers Service Center, Inc., which was established by Cesar Chavez in 1966. On June 15, 1974, over 3,000 people attended the dedication ceremony for Agbayani Village in Delano, California. The event was hosted by the UFW National Executive Board, which included Cesar Chavez, President; Gilbert Padilla, Secretary-Treasurer; Dolores Huerta, First Vice-President; Philip Vera Cruz, Second Vice-President; Pete Velasco, Third Vice-President; Eliseo Medina, Mack Lyons, Marshall Ganz, and Richard Chavez. The UFW Information and Research Department Records contain a copy of Cesar Chavez’s dedication speech, as well as an original sketch of the Agbayani Village layout, a clipping from Fellowship Magazine about the opening of the village, and an original flier that includes information about how to apply for a space within the newly opened retirement facility. Upon its opening in 1974, the first occupants of Agbayani Village were 57 men and one woman. By 1978, an Agbayani Village Report from the National Farm Workers Service Center, Inc. revealed that there were 47 total occupants: 21 were original strikers from 1965-1966; 2 were strikers from 1967 and 1970; 5 were staff members; 8 were union members; and 11 had no connection to the union. 41 residents paid $70 per month for rent, and the 30 residents who relied on the village to provide their meals paid an average cost of $36.25 per month for food. During its time as a retirement village for Filipino farm workers, Agbayani Village was open to receiving visitors, many of whom were college students seeking to enhance their knowledge of first-wave Filipino immigration to the United States through association with village residents and volunteers. The Philip Vera Cruz Papers contain some of the original correspondence between universities and Agbayani Village that discuss these visits. This collection also holds an authentic orientation packet for visitors to Agbayani Village from 1982, and handwritten daily village activity records. Today, Agbayani Village continues to be owned and operated by the UFW. The last of the original retired Filipino farm workers passed away in 1997. The village now serves as an apartment complex that provides affordable housing for single Filipino farm workers. On February 21, 2011, the village was designated a National Historic Landmark in a ceremony attended by more than 1,000 people. For more information about Agbayani Village and the UFW, see the UFW Vice President: Peter Velasco Papers, the UFW Administration Department Records, the UFW Work Department Records, and the UFW Texas Records at the Walter P. Reuther Library.